With the tough economical situation this year, money for the holiday gifts is tight, but a popular solution to this dilemma is to make handmade presents. If you aren’t feeling crafty, or have no idea where to begin, you can find some fabulous handmade items for sale on sites like http://www.etsy.com. Etsy offers a variety of handmade gifts that will suite any budget. However, if you do want to try something crafty, here are a few ideas that are easy to make and won’t break the bank. Plain glass ornaments can be found at your local craft store. I got a box of 4 for $2. With a little time and a few simple embellishments, you can turn them into beautifully decorated ornaments that will make a perfect gift for a friend. 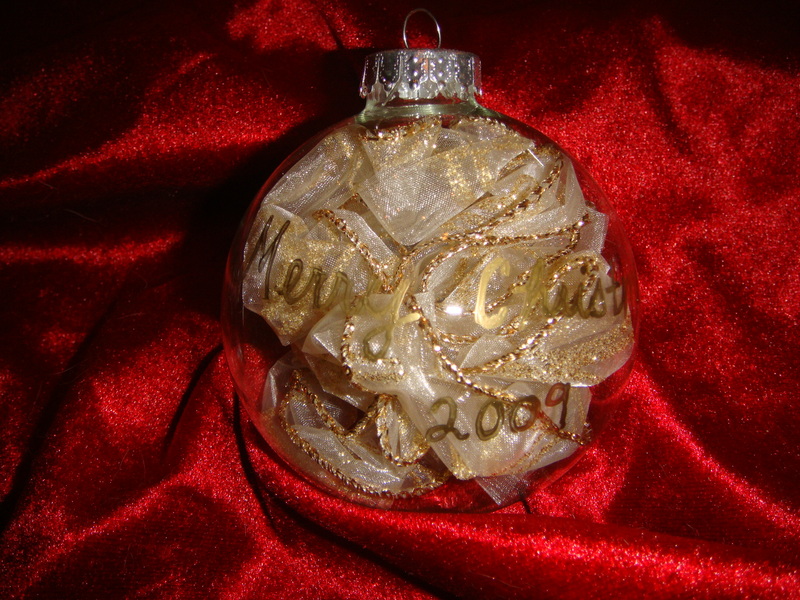 The ornament in the picture above I made by stuffing it with gold ribbon and then I wrote Merry Christmas on it with a metallic god pen. You can get a set of blank cards at almost any craft shop and personalize them with stamps, speciality paper or scrapbook items. I decided to make a set of cards to fit a few different occasions. 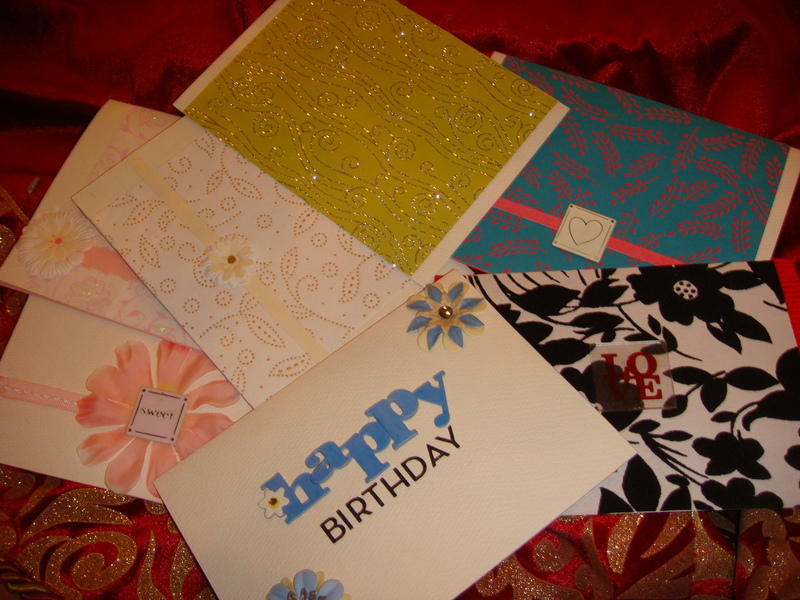 I made a few happy birthday, get well, thank you, and congratulation cards that I plan to give as a gift set to a few of my family members. This gift is perfect for a child, or even a novice crafter. Get a shoe box, or a pastry box and put a few uncompleted craft projects in the box. Just make sure you’ve included all the parts for the craft kit. 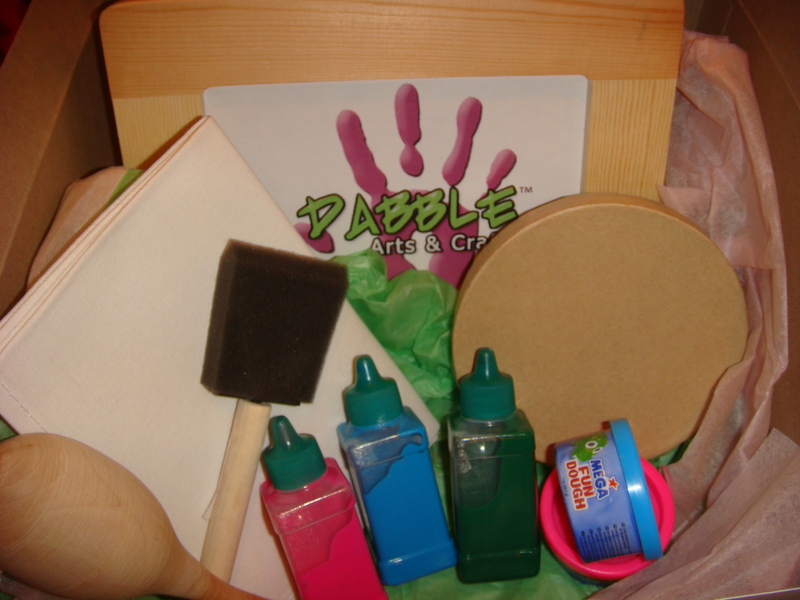 For instance if you’re giving wooden projects to paint, include the brush and the paints. I created a few craft boxes (like the one pictured above) that I sold through Dabble Arts & Crafts. For $15 I have included a wooden frame, ornament, paints, brush, and fun dough. I gave this gift a few times and each time I do it a little bit differently and I try to cater it to the couple I am giving the gift to. It’s pretty simple, get a large shoe box, or a cake/pastry box (you can find a variety of boxes at Micheal’s for $1 or less). Decorate the outside of the box with decorative paper and the couple’s name. Inside the box, you can put all the items they will need for a romantic “date night”. Some ideas are: a bottle of wine, a blockbuster gift card, a bag of popcorn, dessert mix or chocolates, a massager, oils, basically anything that will fit in the box and can be used on a date! This crafty gift has been around forever, but I just love it because who doesn’t love cookies? You can usually find a set of empty mason jars at your grocery store, fill them with all the dry ingredients you’ll need to make your cookie recipe. Type up the recipe instructions and print it on decorative paper then glue it to the jar. Wrap a ribbon around the jar with a gift tag adn your done! I have seen a ton of these at small boutiques from Maryland to California and I decided to try some of my own. It’s an easy way to personalize a gift not just for Christmas, but also for bridal showers, birthday parties and more. I found the cheapest set of glasses at Linens N Things, or Bed Bath & Beyond because you’ll get more for you money. They cost about $12 for 12 glasses. However, you can buy a single glass at places like Home Goods, or Ross. Once you’ve picked the glass you like, you then need to get special gel pens that will write on glass (at your local craft store of course). Have fun and decorate the glass with the recipient’s name, the event, flowers, etc.. To set the paint, you will usually have to bake the glass for about 10 minutes or so after you decorate it (the instructions on the pens will tell you if you need to do this or not). If you’ve decorated a martini glass, it’s neat to also attach a favorite martini recipe to the glass with a special tag. There you have it, a few simple crafty ideas to use for gift giving this holiday season. Hope you enjoy making your handmade gifts and have a happy holiday season!